The New York State event was among several hundred other “sister marches” that coincided with the official Women’s March on Washington that followed the recent presidential inauguration. 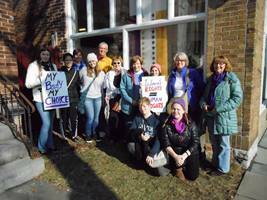 Starting at the Women’s Rights National Historical Park on Falls Street, the Seneca Falls march ended with a rally at the First Presbyterian Church where suffragist Alice Paul introduced text for the proposed Equal Rights Amendment to the Constitution in 1923. During the Women’s March, speakers and participants made historical connections between the 2017 event and the 1848 Seneca Falls Convention, which was the start of the women’s rights movement. “Many speakers showed how the Declaration of Independence and the Seneca Falls Declaration of Rights and Sentiments were linked, and connected their ideas to the message that women’s rights are human rights,” said Messinger. Featured speakers at the rally included Syracuse Mayor Stephanie Minor, the first woman to be elected mayor in one of New York State’s five largest cities; historian Dr. Sally Roesch Wagner, director of the Matilda Joslyn Gage History Museum; and 101-year-old Mary Simpson Smart, who shared her memories of the 1920 national election when women voted for the first time. The rally also featured remarks by Iroquois Nation leaders, including Louise McDonald Herne, who explained how Iroquois traditions influenced the development of representative government in the U.S. In addition, musician Alison Pipitone and others performed original songs presenting messages of equality and inclusion. Daemen’s trip to Seneca Falls was sponsored by the college’s American Association of University Women student organization. College faculty, staff, and students also participated in the Women’s March on Washington, D.C., and in “sister marches” in Buffalo and Berkeley, Calif.